The allegations made in “Silas” are derived from documentary evidence including court record, corporate data, land deeds, site visits and interviews, governmental and institutional reports, among other sources of information. As much as possible, we have used evidence that is publicly accessible and produced by formal bodies. Where first person testimonies were relied upon, we have corroborated these with affidavits. Certain evidence may be confidential or may expose sources --- these we have not put in the public domain. Where parties such as companies or persons have denied allegations, we have documented the same. Where they have yet to respond or did not respond by deadline, we will continue to update the site. For more information on the role of militias: https://www.globalwitness.org/archive/taylor-made/. Further information on “conflict timber” is also available in the UN Panel of Experts Report on Liberia published in December 2012 which described Private Use Permits (PUPs) as vehicles facilitating militia activity used for staging attacks and resources used to finance military activity in areas that were vulnerable and often beyond government reach. Until SDI lead the charge to investigate PUPs and which was taken up by the Board of the FDA in February 2012, the FDA had no consolidated list of the total number of PUPs issued by the government. The UN Panel of Experts Report (2012) notes that PUPs effectively replaced other commercial forms such as Forest Management Contracts (FMCs) and Timber Sales Contracts (TSCs). No new FMCs and TSCs were issued from 2010 to 2012 despite 24% of Liberia’s land area allocated to logging companies during 2010 and 2011. More than 60% of all PUPs were allocated to one “consortium” involving affiliated entities such as Atlantic Resources and Forest Ventures and associated with Malaysian logging giant, Samling. The report notes this connection through a former Samling principal, Han Dong Chun and the disclosure of a ‘personal stake’ in Atlantic Resources by Samling’s head. Medina Wesseh, a politically exposed person (PEP), was formerly one of three shareholders in Forest Ventures. She is a former Director of the Cabinet and co-chair of incumbent President Ellen Johnson-Sirleaf’s re-election campaign in the same year – 2011 - when 89% of PUPs were issued. The percentage of the consortium’s access – framed as per se illegal by the SIIB report increases when assessing other formal and informal logging partnerships. In addition to the 1,4m hectares forested land already allocated to the group of companies, further access came through entities like EJ&J who assigned permit rights to Forest Ventures. Other companies seemed to be operated by the group such as Alpha Logging. The use of PUPs enabled loggers to avoid the bulk of revenue, estimated at 80%, owed to the government. It also allowed for loggers to circumvent the regulatory control of FMCs and TSCs. Instead, both the UN Panel of Experts and the SIIB report characterise PUPs as defined by forged or missing land deeds; procedural errors; disregard or misapplication of Community Rights Laws; loggers obtaining rights in protected areas or areas not under the domain of "private land" and for prolonged periods; lack of due diligence on loggers; official instituting a system where illegal activities took place; officials abusing their power to ensure financial gains for logging companies and possibly themselves; officials receiving irregular payments; and officials consciously disregarding the illegality of actions in affairs detrimental to Liberia and its natural resources. After an interview with Han Dong Chun of Atlantic Resources, the UN Report concluded that PUPs comprised an, "alternative, largely unregulated route to substantial concession holdings, bypassing a formal concessions process." In 2014, a grand jury representing the Liberian government found key FDA officials in collusion with MLME officials were “more probably than not” guilty of economic crime, forgery, criminal conspiracy, deception and obstruction of governmental function by a public servant. Yet outside of the UN Panel of Expert’s report, mention of Liberian PEPs such as, but not limited to, Wesseh, are conspicuously missing. To date, the companies have not been held accountable. Principals and companies continue to operate. Medina Wesseh declined to respond at the time of publication. Politically Exposed Persons (PEPs): The generally accepted definition of Politically Exposed Persons (PEPs) are those previously or currently holding public positions and/or those who are family members of close associates of the PEP. Potential abuse originating from PEP-related activity is broadly defined by international law as directly extending to the executive, legislative, administrative, military, judicial or other branches of government; as the head or a government entity and corporation or a foundation or business that has been formed by, or involves, PEPs or their family members. The latter extends to parents, children, spouses and other close family members and close associates and where such persons can conduct activity benefiting, or on behalf of, another political figure or their family and self-interest. The risks involve bribery, undue influence and corruption for the purposes of illicit or illegal gains or activities. Medina Wesseh, Augustine Johnson and Robert Sirleaf are among those who fall into this category. Augustine Johnson, named in the Indictment is singled out by the "Jackson Report" as a, "Government trained GIS Expert...the alleged architect of the PUP scheme (doctoring and creating deeds, identifying forest areas, and developing maps used in creating fake deeds)…he has FDA proprietary software and is only person knowledgeable, and/or capable of developing and providing maps with GPS metes and bounds for PUP on lands formerly identified as possible FMCs/TSC’s." Augustine has since emerged as a key player in timber shipments through a joint venture, Mandra-LTTC, accounting for about half of all timber documented exports from Liberia post moratorium. Mandra is a PUP-holder. In an email, Augustine Johnson declined to answer a list of questions emailed to him, saying that he was, "not interested in responding ...if you are serious to get the real facts, kindly proceed to ...others to get the real story." His email signature confirmed his role as general manager of Mandra Forestry. Augustine Johnson was also cited as a partner in EJ&J, a company that transferred rights to Forrest Venture. General Auditing Commission (GAC), National Oil Company of Liberia (NOCAL) and Robert Sirleaf Foundation (RSF) denied the authenticity of the GAC audit documents (see below) that probed use of $10.5 million in CSR monies contributed by Chevron to social and development projects in Liberia. The document alleged that monies were remitted to Robert Sirleaf Foundation (RSF) in part or whole. Timby’s investigations into the alleged recipients of the monies from RSF confirmed that no monies had been received. Certain entities acknowledged that Chevron had directly remitted monies to their organisations. Chevron denied any wrongdoing including but not limited to monies remitted to RSF. Accounting for the use of monies and the procedure through which monies were remitted remain vague. Confidential cables show President Johnson-Sirleaf instructing Chevron to remit monies outside of the Government of Liberia (GoL). In her acceptance of Robert Sirleaf’s resignation as head of NOCAL in 2013, she commends his leadership and the social and community development projects that took place under his term. Robert Sirleaf did not respond to emailed interview questions at the time of publication. His response will be fully published when received. TIMBY directly interviewed the owner of the land on record. The owner confirmed that land was leased but never sold. This was confirmed by the title deed to the land in Timby’s possession. TIMBY visited the cybercafé: with its plastic chairs and barren interior, the hub did not appear to be on the receiving end of any significant investment. The President’s office requested a period of six months in which to respond to allegations concerning oil and timber corruption. Her office was given four working days to respond. An offer to extend the deadline to seven working days was denied. 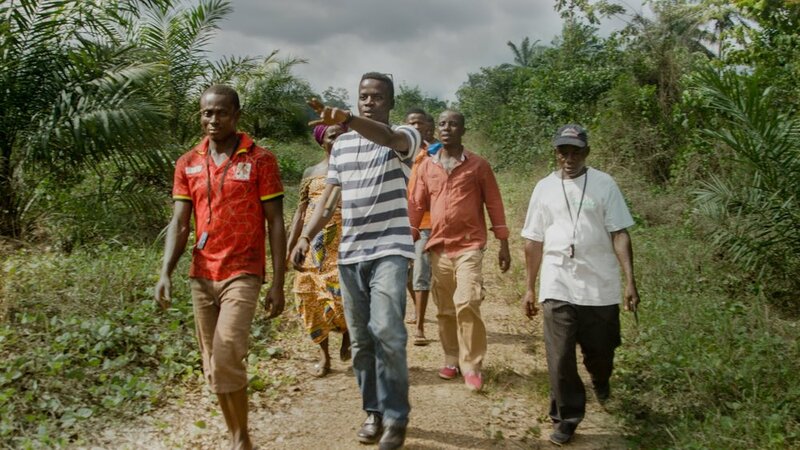 In articles written for Time magazine, New York Times among others, journalist Wade Williams exposes his point of view about the process through which the relevant Liberian authorities failed to manage the ebola outbreak. This included the bodies of ebola victims dumped in shallow graves. Timby obtained an affidavit from Williams and other sources certifying the information, including video footage, was true and correct. Timby’s allegations are based on evidence including a recording taken during the court process. On April 3, 2014 SDI attended the court hearing of the Jogbhan Clan Chief (Railey Tompoe). At the hearing, EPO security guards were unwilling to let SDI staff take photos of court surroundings. In the audio, Henry Freeman, the chief of Security for EPO clearly states that the company controls the court -- despite it being a state institution. The argument ensued between SDI and the EPO security after a photographer attached to SDI attempted to take photos in the court. The tension was high because SDI is seen as the ones who helped push the chief to stand up to EPO. Court Official(to Chris - SDI - taking photos): "I say, my brother, HEY! My man, don't do that. I beg you don't do that." Silas: "He's not in the court." Court Official: "No but we're all in the picture." Silas: "No but then leave from there." Court Official: "No, we were sitting here now." Freeman: "Let us know for what reason he's here...who knows that the man is taking my picture. We have the right to stop him because we control this company as a security..."
Freeman: "...this court is being managed by EPO." ...argument goes back and forth, EPO security actually calls for reinforcements. In the end the judge calls SDI staff aside and checks all media(pictures and videos); once it was proven that SDI wasn't focusing on Freeman or any other EPO staff, the argument ends and the staff was let go. Grand Jury of Liberia alleges $6m in commensurate value from timber is lost in indictment. Indictment by the Grand Jury of Liberia charged five FDA employees with economic sabotage, criminal conspiracy, forgery and counterfeiting and the loss of US$6 million in revenue. Defendents included Moses Wogbeh, former FDA managing director; John Kantor, former FDA technical manager; Jangar Kamara, former FDA Manager for Commercial Forestry; David Blayee, former Surveyor for Grand Bassa County at the Lands, Mines and Energy Ministry and Maxwell Gwee, former Director of Cartography at the Lands, Mines and Energy Ministry. Conspicuously absent was Augustine Johnson, then- key official at the FDA. The indictment declades the five officials knowingly conspired to defraud Liberia in facilitating the illegal issuance of sixty-one PUPs that wrongly authorised commercial logging on 2.5 million hectares of land equivalent to 24% of the country's land. FrontPage Africa alleged there was little transparency and accountability emanating from, "Task Force operators... answers are in short supply with focus limited to the US$100,000 while the public has been unable to get an explanation as to how the US$5 million was expended."